Central Institute of Fisheries Nautical and Engineering Training (CIFNET) invited applications from the eligible candidates to fulfill the vacant post of Instructor (Workshop) on deputation basis. Central Institute of Fisheries Nautical and Engineering Training, Cochin, a subordinate office of the Department of Animal Husbandry Dairying and Fisheries. Selected candidates will be posted at CIFNET unit Visakhapatnam. · Degree in Mechanical Engineering or Marine Engineering from a recognized University. · One-year experience of supervising welding or machining or fabrication, overhauling or fitting work of various machinery like pumps, compressors, boilers, etc, in a recognized Mechanical or Marine Workshop or Institution. 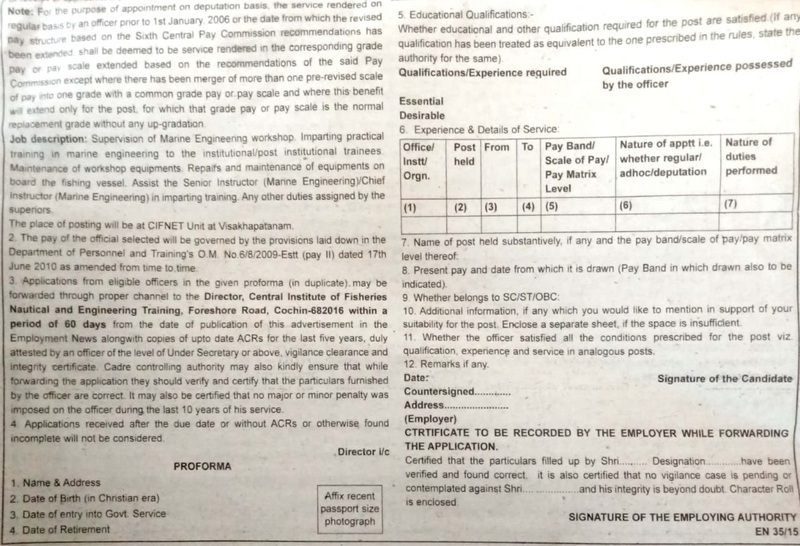 Pay Scale: Selected candidates will be paid in the pay band of Rs. 9300-34800/- plus Grade pay of Rs. 4200/-.